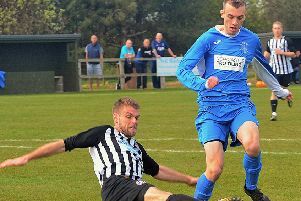 Alnwick went into this game on the back of a mid-week draw and a win but could not field the same team due to the usual weekend problems of injury, work and other commitments. Alnwick brought into the squad Joseph Pickard, Joseph Threlfall and Liam Cravagan, who all must be commended for putting themselves up for selection. It was quite a step up in the level of football for Cravagan’s first game. These juniors/reserves have helped the club through an horrendous league programme when other, more experienced players made themselves unavailable with Alnwick having seven games in 14 days. Easington brought two of their forwards back including their top scorers including Jack Pounder. On a firm, fast surface Alnwick showed some early good moves and had the best chance after 10 minutes when Chris Laidlaw beat a defender and was clear on the wing but had to hold up his pass until the troops arrived to send his cross over, only to see it cleared. The visitors were showing little until after 15 minutes a cross went to Kieran Mitchell to send over a looping header. Town immediately went on a swift attack, sending a free kick down to Jake Lowes on the wing, who cut into the box, but defender Jake Metcalf managed to clear at the last minute. Easington’s top scorer was being kept quiet when Pounder sent through a pass to Kieran Mitchell, splitting the home defence but Alnwick’s keeper, Robert Hodgson was alert to the danger and collected the ball. Town took a deserved lead after 25 minutes when Lowes put a great defence splitting ball for Jonathan Wilson to run onto and round the keeper: 1-0. It was mostly Town on the attack with sporadic attacks by Green and Talbot, each being easily dealt with by the home defence. Darren Riddle and Chris Laidlaw were causing the visitors continuous problems when a slick move resulted in a good cross with Westphal and Wilson waiting at the far post, only to see the ball drift out. It was Lowes next to send a cross ball for Chris Laidlaw to run onto but he had to chest the ball and it went wide with Easington’s keeper flat-footed. Alnwick should have gone two up when Kevin Westphal and Chris Laidlaw forced a goal line clearance. With three minutes gone in the second half Easington drew level. The visitors went down the right and a low cross was tapped in at the far post by Liam Cooke. Resilient Alnwick went on the attack, pushing the visitors back when a free kick on the right found Chris Laidlaw who broke into the box and hit a chipped shot over the keeper and hit the cross bar. The visitors then took the lead through James Talbot. There were chances at both ends, but with Alnwick missing theirs, Easington netted twice in the closing stages to seal their victory. The season is drawing to a close and the last game is away on Saturday (May 5).